When you need comprehensive dental care, there’s only one place to go. 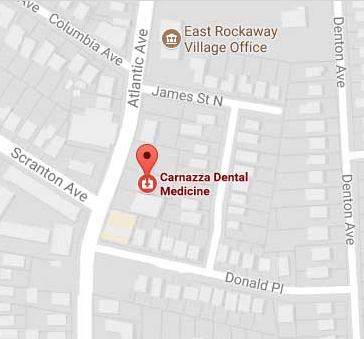 Carnazza Dental Medicine offers East Rockaway patients a full line of dental services to improve their smiles and promote long-term oral health. With a strong work ethic and a gentle, compassionate demeanor, Dr. Carnazza is the go-to hometown dentist. He’s skilled in a wide range of dentistry, delivering personalized, professional care to all patients. Combining the latest dental technology along with years of experience and patient-focused care, Dr. Carnazza and his team are engaged in the longevity of every smile. Our dental services achieve a balance between aesthetic and health, ensuring your smile looks as great as it feels. With us, you’ll never feel pressured to have a specific service. We make recommendations, but we always take your concerns, budget, and needs into consideration before performing any treatments. You are in control of your oral health, and we’re here to help you make the best choices for your smile. We don’t intimidate, overwhelm, or force you into having procedures you don’t want. Instead, we’ll work with you to create a full treatment plan that makes the most out of the smile nature gave you. Dr. Carnazza is one of the only local dentists in the area that can place and restore dental implants. Why head to the corporate style clinics for your dental care when you can get personal, friendly service from a team who respects your smile. We offer the same dentistry services as the others, but our skill and commitment to patient care really set us apart. From routine care that maintains your beautiful smile to restorations that keep your mouth functioning correctly, and even cosmetic and implant dentistry to improve the health and appearance of your smile, Carnazza Dental Medicine has it all. Contact us today and see how we can transform your smile and make it radiant and healthy. Which of our services is right for you? Ask us for a consultation! Call (516) 882-5120.